Cindy Pon writes the kind of fantasy that Tu Books focuses on: fantasy inspired by a minority/non-Western culture, with characters and themes who have fears and hopes and challenges that a reader from any culture can relate to. Cindy's perspective is insightful and thought-provoking, and I hope that you'll enjoy her thoughts here and go find Silver Phoenix if you haven't read it yet. I talked to Cindy in preparation for Teen Read Week, but her schedule and mine didn't work out to post this during the actual Teen Read Week—so we'll continue celebrating "reading beyond reality" beyond the one week, and we hope you do too. Stacy: I read Silver Phoenix and I loved it. I cringed for Ai Ling several times—you aren't afraid to put her in awkward situations! 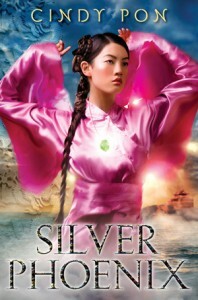 Silver Phoenix is set in the Kingdom of Xia, a culture much like that of ancient China. You've talked about this on the Enchanted Inkpot, but I wonder if you'd talk to us a little about the challenges of writing a girl character in a historical setting, especially one that's misogynistic or paternalistic, and how you had to navigate that culture to be able to tell the story you wanted to tell. Was it hard keeping within the bounds of a girl's prescribed role? You broke a few boundaries by having Ai Ling set off on her journey alone to save her father, but she's very traditional in other ways. How did you push at those strictures to create a strong character who girls today could identify with? Cindy Pon: It really was a challenge, Stacy. I had done research for this novel and was very well aware that a girl's place was within the inner quarters—at home, but not even all of the home, but the women's part, away from the public and the men's domain. I struggled with trying to come to terms with what my book was, but became mired under historical details that would have rendered Silver Phoenix impossible to tell—as I wanted to tell it. I realized then that I wasn't writing a historical. Or a historical fantasy. Silver Phoenix is inspired by ancient China, but it doesn't take place in China or in an actual time in history. In this way, I was able to keep the feel of China but still tell Ai Ling's story. Many details like breast binding and how hair is worn were made up by me and contributed to the Xia culture. I most certainly wasn't writing a Chinese story. I'm Chinese-American and I think the story relates my viewpoint. I found the dichotomy of obeying your parents and needing to grow and become independent easy to relate to—a universal theme of growing up. Whether the reader is willing to "buy" my story is a personal choice. Why did you write a book set in this culture? Were there myths, legends, or fairy tales that you drew on? You've got quite a range of demons and other supernatural beings who show up—what were your influences? When the idea of this novel came to me, I had just begun studying chinese brush painting and becoming more interested in learning about the art and culture. (I did take classes in Chinese studies in university but that was more recent times, like the cultural revolution, etc.) Fantasy has and always will be my first love genre. So I thought I'd write a story that combined these two interests. Something like the snake demon is very much rooted in Chinese folklore. The one armed tribe and passing the land of women, those were all in a very old book that most Chinese don't even know today. But I also loved creating monsters, and most of them were from my imagination—usually a creature or situation that I'd personally find terrifying (drowning, death, and corpses . . .). I read that you were born in Taiwan and grew up here in the States. And you've mentioned to me that you used "old brother" in Silver Phoenix instead of "big brother" or "older brother" as an honorific because it's a direct translation from the Chinese. Do you feel that knowing the language, or being a part of a modern culture descended from the culture you're writing in helped you to craft your setting more fully? Did you travel to China (or to Taiwan, perhaps) at some point to visit historical sites? What worldbuilding advice might you give to writers on creating a fully realized setting as you've done in Silver Phoenix? I think so. For another writer, they may have to research more within the culture they want to write, if it isn't something they grew up with. (But research is a fun part of writing!) I wish I had visited China! But no, one day. I had to rely on some magnificent travel books with gorgeous fotos and online research as well as films to immerse myself in the feel of the story. I visited Taiwan and did get a chance to visit a museum to look at Chinese brush paintings. When you were a teen, did you read much fantasy? Why or why not? Oh, yes. It was my favorite genre! At least, the stories that made a lasting impression. I loved Tad Williams, Terry Brooks, Tolkien, Madeleine L'engle, Piers Anthony, Anne Rice, Stephen King, Dean Koontz (I guess latter more horror?). As an adult I discovered Ursula Le Guin, Neil Gaiman, Megan Whalen Turner, Ellen Kushner. I honestly wonder if there will be a day when I can write a novel without fantastic elements in it. I think fantasy (and speculative fiction) is so liberating. You are only limited by your own imagination in the worlds and stories you create. Culturally and ethnically? No. I can't think of a book growing up that I loved that had even one single Asian or Asian-American character in it. I didn't even think about it. I couldn't get a Barbie doll that looked like me, why should I expect to read a story that had someone like me culturally? It doesn't mean that I didn't relate to my books and stories. I loved Island of the Blue Dolphins by Scott O'Dell, and the heroine is of a culture and from a place I am unfamiliar with, but I still sympathized with her plight. And another favorite series by Noel Streatfield had girls in England—all learning something (like dancing or ballet) that I knew nothing about. And A Little Princess by Frances H. Burnett also based in England. Could read that over and over. This is why stories are so wonderful to me. If the author did her job, you can love and relate, even to something that isn't exactly like you. And I'll say the same of Silver Phoenix. You may know nothing about the Chinese culture or having to be forced into a betrothal, but I don't think that means you wouldn't like or relate to Ai Ling's story. One of the biggest compliments I received was from a reluctant reader who wasn't so into this Asian fantasy book, read it and loved it. That made me so happy! The theme of Teen Read Week is "Read Beyond Reality." How does reading—not necessarily fantasy and science fiction, but since you're a fantasy buff, feel free to answer about that—take you beyond your own reality? What do you look for in a good book? So I love to watch foreign movies. [Stacy: Me too!] And I don't mind reading subtitles one bit. I'm a bit boggled when I learn that the average American doesn't like foreign films or subtitles. When I read, I love escapism, and if I can learn something about a different culture or become immersed in the author's world and characters, that is the best experience for me. I've read beyond my comfort zone and favorite genres since deciding to become a writer—and I would encourage all readers to do the same. If you only read romance, try some mystery. If you only read high fantasy, try contemporary or urban fantasy, etc. You never know if you discover a book you love you may never have tried before. Tell us a little about the teens who read your book. Is it a new experience for them to read about an Asian protagonist, especially to read fantasy set in an Asian setting? What kinds of reactions have you gotten so far? I had fans who enjoy manga and films such as spirited away that loved my novel. I've had quite a few readers who don't read fantasy, much less ones with a historical asian inspired feel, but did and really enjoyed it as well. I also met some boys who read my book—and that always makes me happy! It's important because I'm of a multicultural background and most of us live in a multicultural world. I think reading beyond what you know and what you're used to and what you're comfortable with helps us to grow not only as readers but as people.